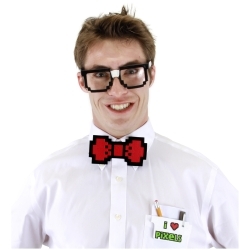 Show you geekiness this Halloween with the 8-bit pixel nerd kit. The kit includes all of the items in a traditional nerd kit but they have been given a 8-bit pixilated twist. The 8-bit pixel nerd kit is colored as pictured. Kit includes glasses with tape, bow tie, and pocket protector. Kit is one size fits all.